Illustration courtesy of Triumph Motorcycles. The 2001 Triumph Bonneville was perhaps the most awaited bike of the year; the re-introduction of one of motorcycling's most famous models. In collecting information for this review I have been assisted by Steve Crocker, a 2001 Bonneville owner who lives in Sydney, Australia. Steve's previous bike was a Suzuki GT-750. He has graciously consented to share some insights and opinions about his new Bonneville for this article. (Isn't the Internet wonderful?) The responsibility for the accuracy and presentation of the information in this review remains mine, however. The new Bonneville is not a clone or copy of its famous namesake, but rather a modern motorcycle designed to fill the void created by the demise of its illustrious predecessor. This is much the same approach taken by Kawasaki in the design of its W650, a machine it is hard not to mention in any review of the new Bonneville. (For a real comparison of the new Bonneville, W650, and H-D Sportster, see my article 2001 Comparison: Bonneville, Sportster, and W650.) Of course, the new Bonneville is a real Triumph, made in England, an advantage with which the Kawasaki cannot compete. 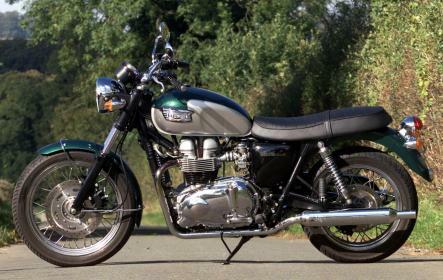 It is also natural to compare the new Bonneville with the 1969 T-120 Bonneville 650, generally regarded as the high point of classic Triumph design, and the very model Triumph engineers used as a guide for the design of this new bike. The first thing you notice about any new motorcycle is how it looks. In this case my first impression is favorable. More so than I expected, as photos of the prototype Bonneville published in the motorcycle press showed some rather noticeable flaws. (Actually, the visual flaws probably aren't that glaring, but to those of us who knew and loved the old Bonneville, any visual flaw becomes noticeable.) The flaws are still there, and I will discuss them in detail later in this review, but they are not as glaring as the early photos made them appear. The overall look of the 2001 Bonneville that is the subject of this review is very handsome, and there is no doubt that this machine is a genuine Triumph. The gas tank and fenders of the Cycle Parts demo Bonneville is painted two-tone forest green/silver; Steve's bike is scarlet/silver, the alternative color scheme for 2001. The paint is well applied, in a pattern reminiscent of (but not identical to) the 1969 Bonneville. There is chrome on the case side covers, rear shocks, rims, headlight, tail light assembly, exhaust system, and various smaller bits and pieces. The side covers (actually air box covers), fork legs, instrument housing, frame, and swing arm are painted black. The tank is accented by traditional chrome Triumph badges. Triumph has applied the right finish in the right places; the overall effect is both restrained and attractive. It is also very similar to the finishes used on the 1969 Bonneville. The laced wheels look "right" for this bike, despite the consequent necessity to run inner tubes in the Bridgestone Battlax BT45 radial tires. Triumph finally got a front fender right; this handsome example is a copy of the style used on the 1969 Bonneville, chrome struts and all. The big chrome halogen headlight is also good looking. In summation, I like the looks of the new bike. Steve likewise reports that everywhere he goes people admire his scarlet and silver Bonneville. Even Harley riders, as Steve related to me: "My biggest compliment has been from a Harley rider at a traffic light who surveyed my Bonneville up and down, pursed his lips and showed his approval with 3 or 4 measured nods and the hint of a smile. My guess is that a lot of Harley guys don't mind Triumphs, or at least Bonnevilles. Perhaps (they have) memories of times past when they were fellow gladiators." Underpinning the new Bonneville is a rigid, mild steel, double downtube frame with a rectangular backbone. A conventional non-adjustable 40mm telescopic fork with 4.7 inches of travel controls the 19-inch front wheel. The front forks are raked out at a 29-degree angle, with 4.6 inches of trail. (A fork rake of 25 to 30 degrees is generally considered standard.) A conventional swingarm controlled by dual shock absorbers with 4.1 inches of travel, adjustable for preload only, keeps the 17-inch rear wheel in line. The suspension at both ends is firm but not harsh, chosen for good handling. The most intrusive visual flaws, starkly revealed in the early photographs of the prototype Bonneville, are the exhaust system, the flange around the lower edge of the gas tank, the lack of a tachometer, and the tail light assembly. They are still there on the production bike, but none are as intrusive as they appeared in the early photographs. Perhaps the worst offender is the exhaust system. It has a kink in the header pipes and oversize mufflers. Triumph offers freer-flowing accessory mufflers, which may be tidier than the sock items, but I have not seen them. Still, the exhaust system does not look as bad in person as it does in most photographs. A standing adult normally views a motorcycle from head height. Seen from that perspective, the jog in the header pipe before it enters the muffler is not so obvious. Most photographs of motorcycles are taken from about headlight height, a much lower vantage point, which unduly emphasizes the unfortunate bend in the header pipes. This bend was allegedly necessary to avoid dragging the mufflers, because the engine/transmission cases are so much bigger than on the old Bonnie, but there must have been a better solution (upswept mufflers, for instance). The Bonneville uses single wall chromed header pipes, and they "blue" rapidly. I have read that this is due to the emission-control air injection, which causes excessive heat at the header. Thank you, Big Brother. There is an unsightly pressed steel flange around the lower edge of the gas tank, which is also not as apparent (or at least as intrusive) when seen from a normal standing position as it is in low-angle photographs. Old Bonnevilles had the seam running down the center of the gas tank, where it could be hidden beneath a chrome trim strip. Why isn't the new Bonneville tank manufactured in a similar manner? Old Bonnevilles also had very small and trim 2.5 gallon gas tanks, but I am happy to report that the new Bonneville's 4.3-gallon tank is surprisingly narrow and attractive for its size. It is not nearly as bulbous looking from the rider's position as the gas tank on the Thunderbird. While I am on the gas tank, I might as well point out the lack of kneepads on the sides of the new tank. This is a mixed blessing, for while I like them, they were one of the first things removed by many Triumph owners back in the 1960's. They are available from Triumph as an accessory, and Steve has already added them to his bike. There is simply no excuse for not supplying any motorcycle with a tachometer, particularly a Bonneville. The very name implies performance, as does the DOHC, four valves per cylinder design of its short-stroke motor. To omit a tach on this bike is an oversight of the first magnitude. Triumph doesn't even offer it as an accessory for the new Bonneville. Instead, to the right of the 140-mph (!) speedometer is an asymmetrical panel with a cluster of four round "idiot" lights: turn signal, high beam, neutral, and oil pressure. Triumph, put a tachometer next to the speedo, and string the warning lights in a vertical row between them! In this Steve concurs. He writes: "I think the lack of a tachometer is a shame both visually and functionally. Due to the wind noise at speed and the lack of exhaust din, I am often uncertain of what gear I am in; a glance at a tachometer conveys that information. After a hot day of riding last week the idle speed gradually went up until I couldn't engage gear without a substantial thump. I went searching and found a knob under the left carburetor that enabled me to adjust it, but a tach would have been a welcome addition for turning the revs down to the recommended idle speed when I had to make an adjustment. Triumph should immediately introduce a new instrument cluster with a tachometer for the Bonneville, and retroactively fit it to all existing Bonnies." The taillight assembly on the new Bonneville is better looking than it appeared in early photographs. It is a chrome unit, not as well integrated as the 1969 Bonneville's streamlined tail light, but not bad, either. The Bonneville's seat height is 30.5 inches. The seat is thin and fairly hard. Its traditional flat shape allows the rider to change position on long rides. Steve is 5' 11" tall and can put both feet flat on the ground when sitting on the stock seat. I am 5' 10" and can do the same. Beginning and returning riders will especially appreciate this. Both Steve and I appreciate the relatively low height of the stock seat, but I think the seat could use additional padding. Steve feels that an extra inch of height would slightly change the angle of his thighs, making the riding position more comfortable for long trips. In any case, Triumph already offers alternative seats for the new Bonneville. Steve occasionally takes his wife or one of his teenage children on rides, and has found the stock seat satisfactory for riding double. He took his 70-year-old mother for a ride, and she loved it! The chrome handlebars have a conventional bend, and can easily be adjusted or replaced at the owner's discretion. The overall seating position and ergonomics of the bike are pretty good. I would ride this bike for a while before deciding on any major changes. In the nit-picky area would be my complaint that the forks have no rubber gaiters. Instead there are little cheap-looking plastic shields that stick up from the lower fork slider. Exactly what the necessity for these is, I don't know, as I have never seen them on any other bike. They look as if they could easily be removed; I hope so, for if I ever get a Bonneville I will certainly attempt to remove them. Other nits to pick are the high maintenance final chain drive (perhaps a new Bonneville had to have chain drive like its forbears), and the lack of self-canceling turn signals. The latter is a safety feature that all motorcycles should incorporate. The unsightly reflector at the end of the (U.S. model) Bonneville's rear fender also has to go. I hope it is easy to remove. Steve suggests that it would be nice if the "Bonneville" decal on the side covers stood out more proudly. The new Bonneville is a very handsome motorcycle, although not quite as "right" as a 1969 Bonneville. Probably, given the intrusion of profuse government regulation, no modern bike can be. This motorcycle is high-tech in many ways. Its traditional appearing vertical twin motor is oversquare, has double overhead cams, and is air/oil cooled; the oil cooler resides neatly and inconspicuously between the front frame downtubes. The bike also has electrically heated carbs (to prevent icing), a hydraulic rear disc brake, and radial tires. These are all features the W650 lacks. A halogen headlight and electronic ignition are also standard, and the bike cannot be put into gear with the side stand down. Wet weight: 499 lbs. (according to Rider magazine). Rider magazine did a road test of the new Bonneville in the March 2001 issue, and reported the following performance: Acceleration, 0 to 60 mph in 5.5 seconds; top gear roll-on, 40 to 60 mph in 5.41 seconds; braking, 60 to 0 mph in 151.6 ft.; Average mpg, 43.8. Cycle World magazine took a new Bonneville to the drag strip and recorded a best 1/4 mile time of 13.83 seconds at 95.34 mph. They reported a 0-60 time of 4.9 seconds, and the bike's top speed was 105 mph. Fuel mileage was 45 mpg. Steve did some performance tests of his own, and here are the results: 0-60 mph in 5 seconds; 0-100 mph in a little under 16 seconds; top gear roll-on, 60-80 mph in 6.3 seconds. The top speed in the various gears is as follows: 1st=45 mph; 2nd=65 mph; 3rd=81 mph; 4th nearly 100 mph; 5th=115 mph @ 7,400 rpm. Steve's average mpg during his first 1,000 miles was approximately 50 (in U.S. Gallons). Rider also took the Bonneville to Borla Performance, where it was run on a Dynojet dynamometer. They reported that the stock Bonnie motor delivered a maximum of 55 rear wheel horsepower at 7,350 rpm, and 40.7 pounds-feet of peak torque. Torque remains above 35 lbs-ft from about 2,750 rpm out to the red line. Horsepower increased in a very linear manner, exceeding 40 at about 5,500 rpm. These seem like pretty good numbers, consistent with the over-square configuration of the engine. Triumph reports that their accessory mufflers, combined with their carburetor jet kit, add about 8 to 10 horsepower. Steve wants the new low restriction mufflers as soon as they are available in Australia. He finds the performance quite adequate, but really wants that extra horsepower, which would give his bike about the same power to weight ratio as his riding mate's old Kawasaki Z1. Certainly the stock mufflers are too restrictive. You can barely hear the exhaust note at idle, and it is effectively obscured by wind noise at speed. I am not a "loud pipes save lives" type of guy, but this is ridiculous. Get the mufflers and the jet kit, and live a little. Steve writes: "I also want a bit more of the old sound because the motor is noisier than the exhaust at present." When I hit the button and started the motor, the first thing I noticed was the lack of vibration. Despite its traditional 360-degree, vertical twin configuration, the counterbalancers in the new Bonnie motor effectively eliminate vibration. Even the view in the large, round, mirrors remains clear. Clutch lever pull is light, and the transmission snicks easily into gear. The header pipes were already very blue on the demo bike, a new motorcycle with very few miles on it. Old Triumph owners will well remember this trait. The bike's motor revs easily and delivers good power and a wide torque curve, but when I fired up the new Bonnie it somehow seemed less aggressive than its 1969 counterpart. No doubt this is due to the lack of vibration and the very quiet mufflers. The old T-120's engine shook the whole bike like a paint mixer. The 1969 Bonneville had a wet weight of only 425 pounds, and a power to weight ratio of 8.17 lb/hp (based on the manufacturer's rating of 52 hp at the crankshaft). The new Bonnie weighs 499 pounds wet, and has a nearly identical power to weight ratio of 8.18 lb/hp (based on the manufacturer's rating of 61 hp at the crankshaft). Steve put it this way: "Performance is quite adequate, good torque, but I really want that extra 10 bhp as soon as possible. The tingle through the bars and pegs doesn't seem to get any worse as the speeds rise. Those counter shafts do work well. At first I wanted more vibration but when I rode at 80 mph for 10 miles or so, I realized that with a windshield or fairing this bike could put many fast relaxing miles into a day. The changes Triumph have wrought since 1969 make life in the saddle easier." The Bonneville's weight, less than most modern cruisers, does not seriously impede the bike's handling or low speed maneuverability. Its center of gravity is fairly low, and it is easy to ride in city traffic. Parking lot maneuvers are also easily accomplished. Steve wrote: "Despite the longish wheelbase it is dead easy to maneuver. The weight, while reasonably substantial, is carried low, unlike my old GT-750. I find this builds confidence both when stopped in traffic and when changing direction. I find I can do smooth circles and figure eight's at 5 mph in a parking lot with my feet on the pegs and feel totally comfortable." On the highway, that same weight, along with good frame geometry and adequate suspension, makes the new Bonneville a stable ride. At freeway speeds it is smooth and easy to ride, not unduly affected by cross winds. It is always willing to ease on by slower vehicles, but to accelerate briskly a downshift is required. The short stroke engine makes its best power at the upper part of the rpm range. Steve did the road testing for this review, using his personal bike. He didn't try to push his new Bonneville to its absolute limits, but he did ride it on some winding roads, which is where the bike shines. He found it to be a smooth, very nice handling bike that is easy to ride at extra-legal speeds. It is predictable, changes direction easily, and has good suspension. It feels planted in fast sweepers. The brake levers have no sponginess, and the brakes have a good feel. To quote Steve, "The pressure applied seems to me consistent with the retardation response expected. I noticed none of the big nosedive I remember with my old Suzuki, but this bike carries 100 pounds or so less weight." Steve reported that, "I traveled the tight bends in our Royal National Park just south of Sydney at about 75% greater than the posted limits in absolute security. The footpegs are pivoted and have metal wear indicators on the undersides, which Triumph says to replace when they wear down 1/2 inch. This indicates that the pegs ground before anything else, although nothing scraped during my testing." "The bike turns easily into corners, almost falling into them, and changes direction without the rider having to heave it over. I was doing about 50 mph when a discarded steering lock appeared in the road ahead. I was easily able to swerve to avoid it and correct the bike again to stay in the same lane. Just to see how easily the bike changes direction, I rode down a country road at 50 mph, flicking the bike from side to side in order to avoid riding over the reflectors in the center of the road. It is really a confidence inspiring bike, particularly for those who aren't particularly skilled, or have rusty skills." "Moderate speed 60-70 mph bends feel very secure, no pitching or wobbling is apparent. It doesn't seem prone to the high corner speed wobbles my 1970's Japanese bikes used to have." The broad torque curve makes it easy to power out of corners. The engine builds power in a very linear manner. Keep the rpm up for best performance. The 5-speed gearbox shifts smoothly, so that is easy to do. The Bridgestone Battlax tires seemed to be up to the task. Certainly the new bike is far less tiring on long rides than was the old Bonnie. The new Bonneville is an easy bike to ride smoothly. This is particularly nice when riding double. Steve put it this way: "I'd much rather be admired as a smooth capable rider than a racer now that I've got a (nervous) wife and 3 kids to double at various times." Steve wrote the following about owning his Bonneville, which I thought was worth repeating: "My 16 year old daughter even thinks I'm cool now. It's one of the best ways to bond with your teenage kids. We ride, I inform them to watch out for cars both parked and moving . . . they then see some foolish driving and I reinforce to them how most car drivers are unaware of bikes and that you must ride defensively, but confidently as well. Makes for great unencumbered teaching because they certainly see it as relevant when they are with you on the bike." Triumph has revealed that they have plans to build variations on the basic platform of the new Bonneville. What these will be and how they will perform, we will have to wait and see. I'd like to conclude with Steve's closing remarks about his new Bonneville: "It is a weekend-only conveyance. No peak hour traffic, no rainy weather, just a symbol of a relaxing weekend away from work. Take my youngest son to his cricket game, take my daughter to her part time job, ride up the winding Pacific Highway or through the Macquarie Pass just to hear the sound of it and throw it from side to side. I'll be up riding by 6:30 in the morning around our local part of Sydney Harbour while the family slumbers on." That pretty well sums up the Bonneville experience. Copyright 2001, 2014 by Chuck Hawks. All rights reserved.